Along with the change in brand name, Toshiba OCZ has also streamlined and renamed their product offerings with a focus on three market segments – value, mainstream and enthusiast with the TR series (formerly Trion) covering the value segment, RD series (formerly RevoDrive) covering the enthusiast segment, and VX series (formerly Vertex, Vector) covering the mainstream segment. While Toshiba has updated their value and enthusiast segments recently, the mainstream segment is due an update and that update has now arrived. Today, Toshiba is launching the OCZ VX500 SSD which will succeed the OCZ Vector 180 in the mainstream segment. 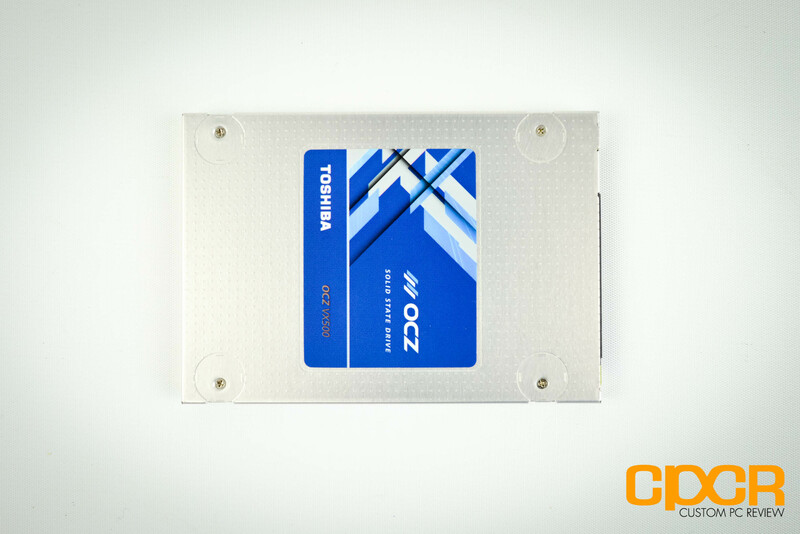 The Toshiba OCZ VX500 will be offered in 128GB, 256GB, 512GB, and 1TB capacities. 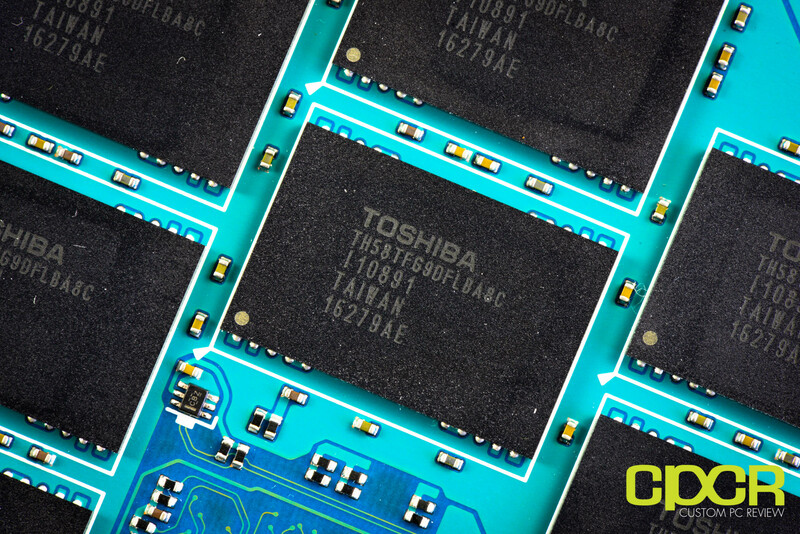 It’ll utilize a combination of Toshiba’s TC358790XBG controller along with Toshiba’s 15nm MLC NAND. There’s nothing too special here, but it’s a tried and true combination of Toshiba’s solid 15nm MLC along with a tried and true Toshiba controller we’ve seen previously. 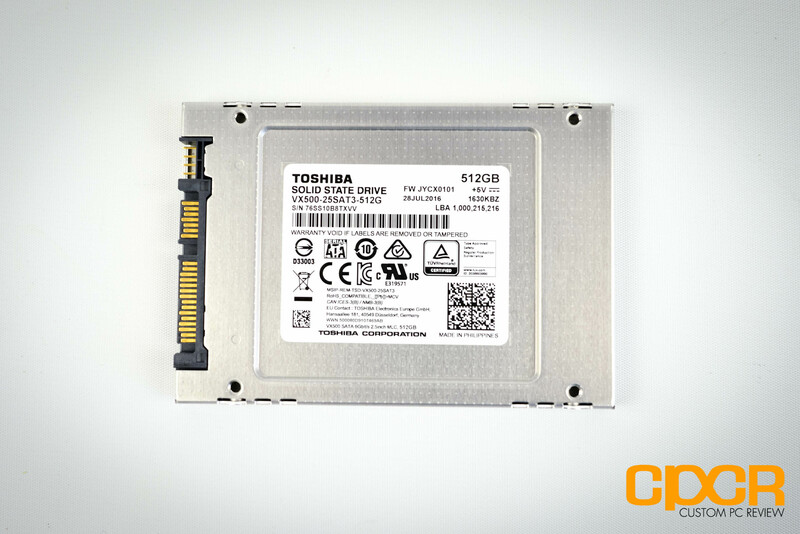 Warranty on the Toshiba OCZ VX500 is 5 years with a variable TBW (TeraBytes Written) rating depending on the drive. TBW ratings will range from 74TBW on the VX500 128GB edition to up to 592TBW on the 512GB edition. 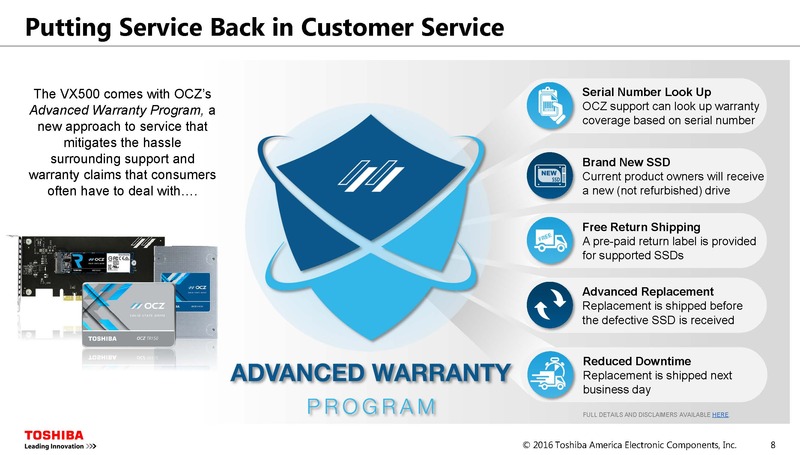 Toshiba OCZ’s warranty will also include what they refer to as “Advanced Warranty Program”. 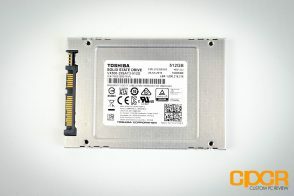 Should your SSD have any issues within the warranty period, they will cross ship a brand new drive and provide for shipping both ways to reduce downtime. Although some competitors offer a longer warranty, Toshiba OCZ’s warranty is definitely hands down the best in the business. 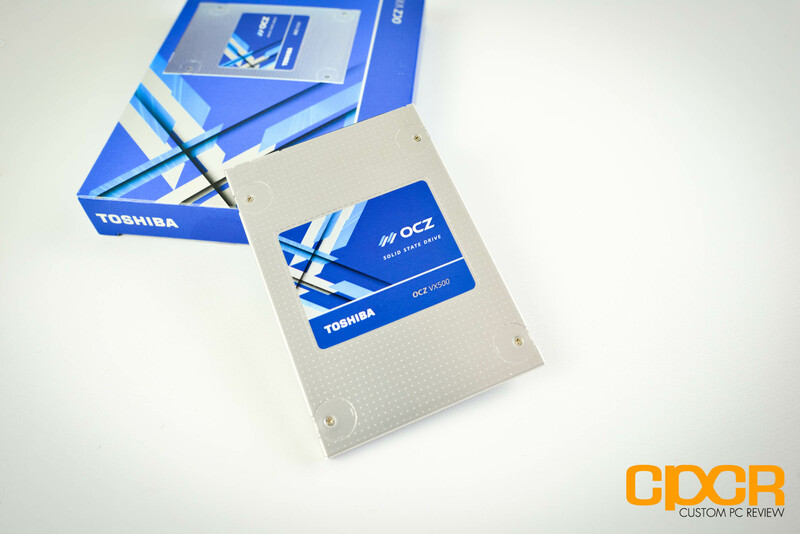 Today we’ll be reviewing the Toshiba OCZ VX500 512GB SSD. 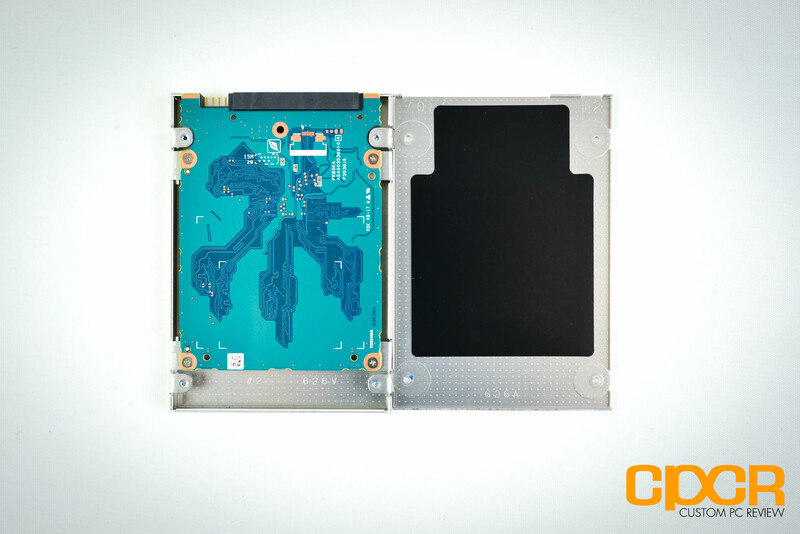 Here’s a look at the packaging for the drive. Included in the packaging is a couple pieces of documentation, a product code for Acronis True Image cloning software, and the VX500 itself. Here’s a closer look at the Toshiba OCZ VX500 512GB. 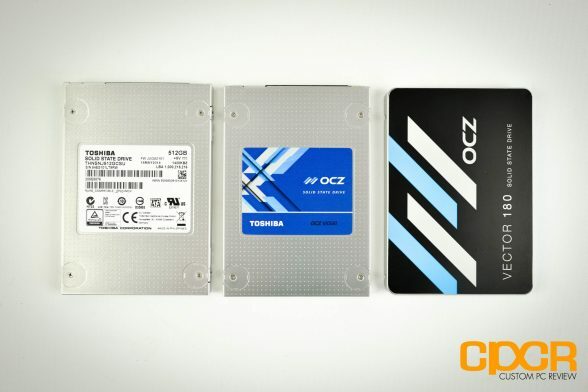 It’s a 2.5″, 7mm SATA drive, but whats interesting is that Toshiba OCZ is now using drive casing and labeling we’ve only seen previously on Toshiba SSDs. 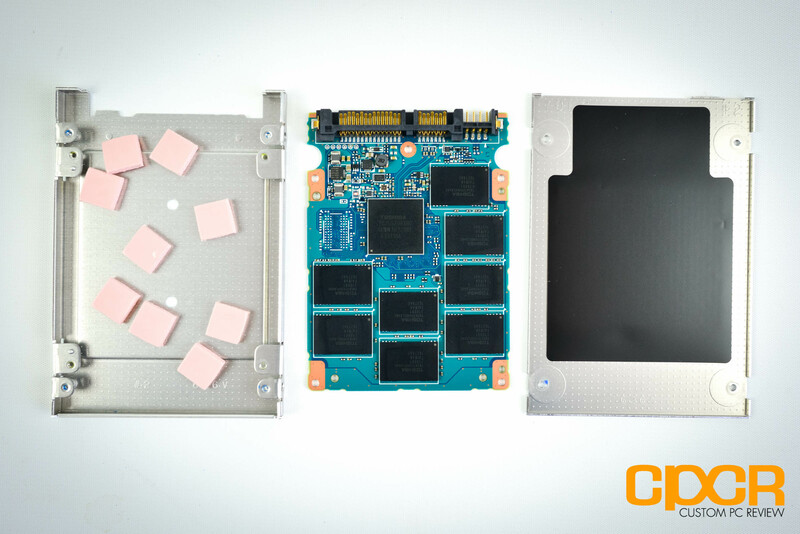 Opening up the Toshiba OCZ VX500 is, we can see 8 NAND packages and a controller. Toshiba SSD controllers are among the few that don’t need a DRAM buffer. 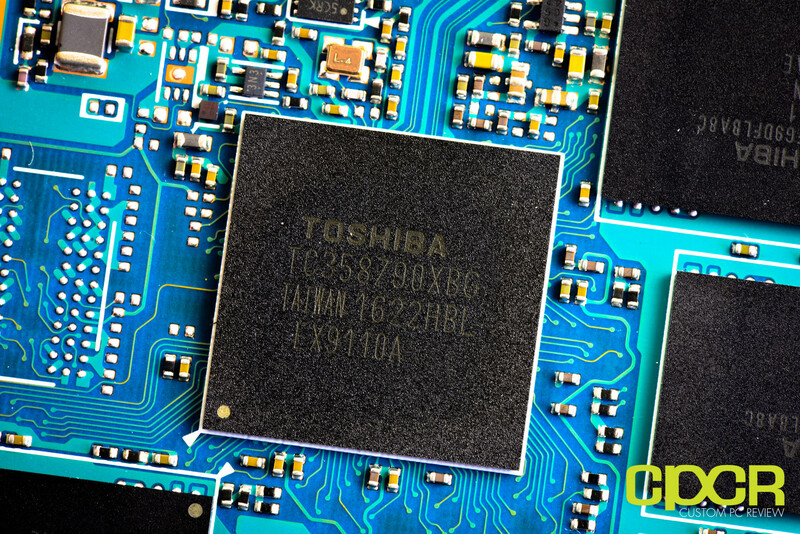 The controller on the Toshiba OCZ VX500 512GB is the Toshiba TC358790XBG. 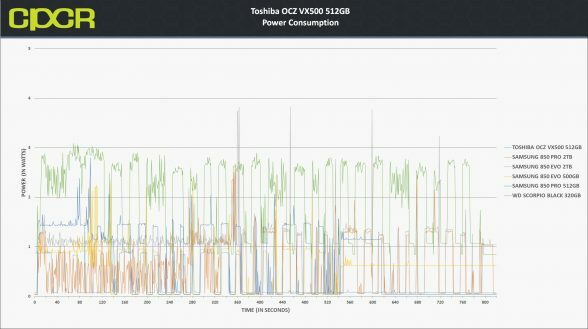 Although it’s quite an old controller that we first saw when we reviewed the Toshiba Q Series Pro several years ago, we still don’t know much about it. What we do know however is that the controller is capable of supporting Toshiba MLC NAND and Toshiba’s proprietary QSBC ECC technology. 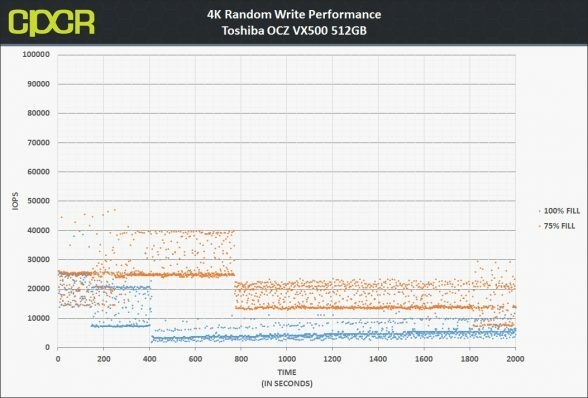 Whether QSBC ECC is used in this particular instance, we have no idea. 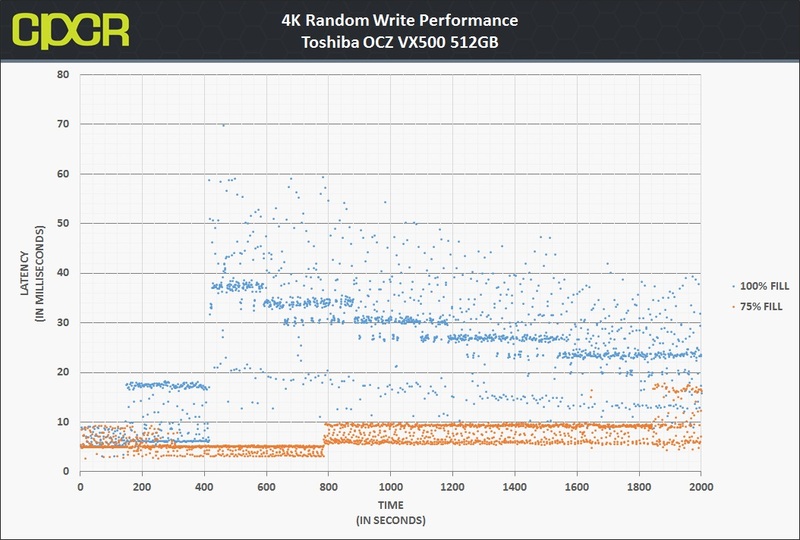 The Toshiba OCZ VX500 features Toshiba’s 15nm MLC (TH58TFG9DFLBA8C), which is very common flash that’s very refined, well understood, and has been around for quite some time. 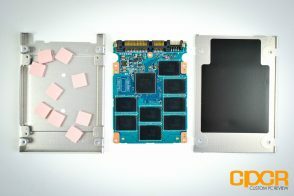 Onboard there are 8 NAND packages which provide 512GiB. 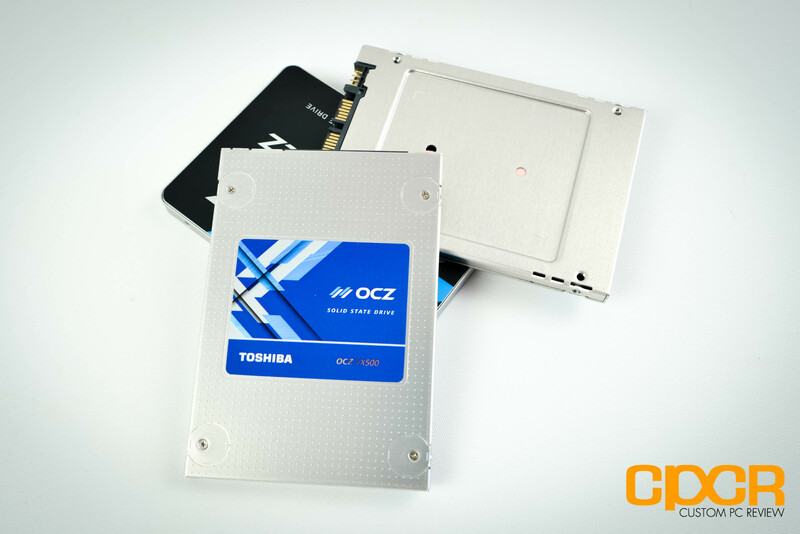 Here’s a look at a side by side comparison between Toshiba OCZ VX500, the Toshiba HG6, and the OCZ Vector 180 which the VX500 is replacing. 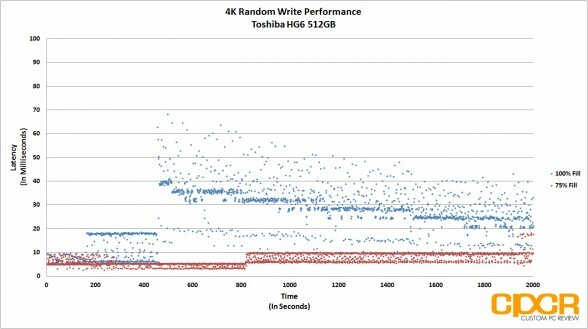 The new VX500 is a far cry from the old Vector 180 and is essentially a re-brand of Toshiba’s existing products. 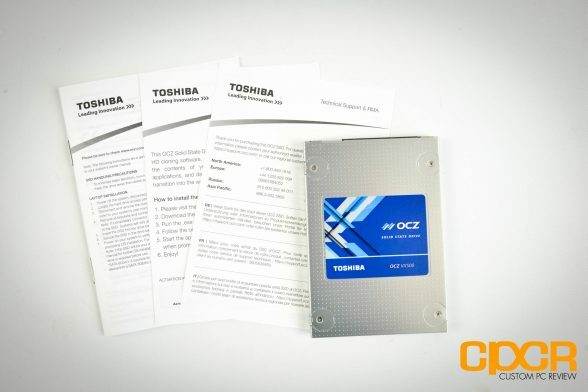 Today we’ll be reviewing the Toshiba OCZ VX500 512GB carrying the JYCX0101 firmware. 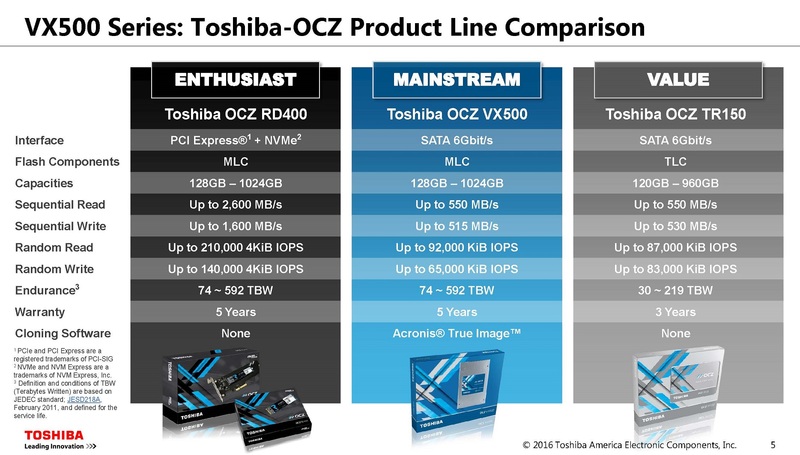 Interestingly, the drive name here doesn’t even mention OCZ. Features of the drive include SMART, Advanced Power Management, Native Command Queuing, TRIM, and DevSleep. The Toshiba OCZ VX500 does not offer hardware encryption capabilities. 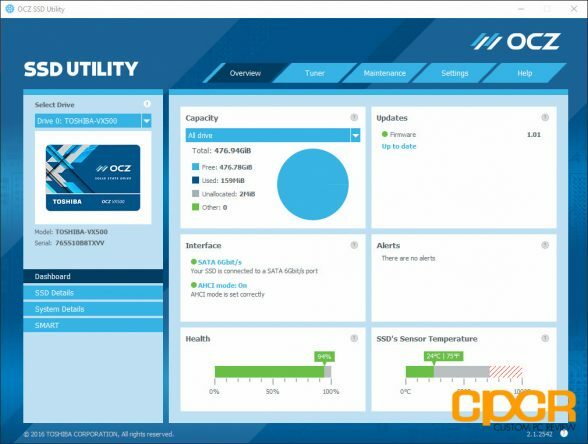 Toshiba OCZ’s software for their SSDs is the OCZ SSD Utility which is a relatively standard software utility allowing you to monitor the status, erase, upgrade the firmware and test your drive performance. 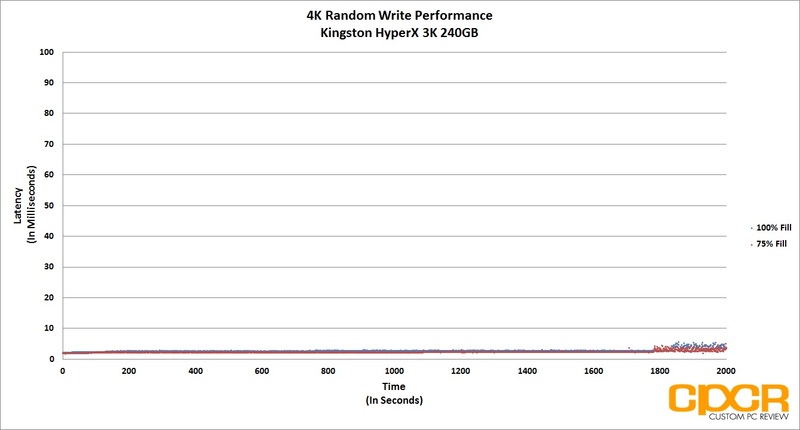 There’s nothing too special here, so I’m not going to go too much into detail. 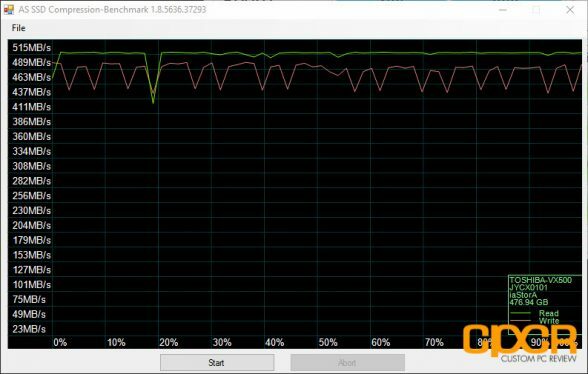 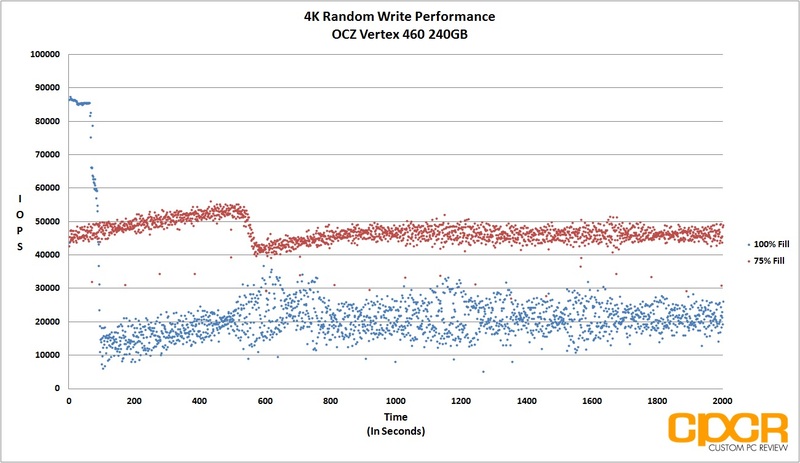 Kicking off strong, the Toshiba OCZ VX500 512GB easily maxes out the SATA bus in ATTO Disk Benchmark, reaching speeds up to 550MB/s sequential reads and 516MB/s sequential writes. 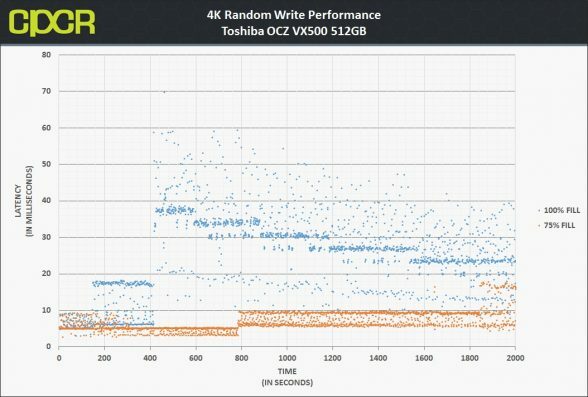 AS SSD performance is good as well with the Toshiba OCZ VX500 512GB reaching 515MB/s sequential reads and 482MB/s sequential writes. 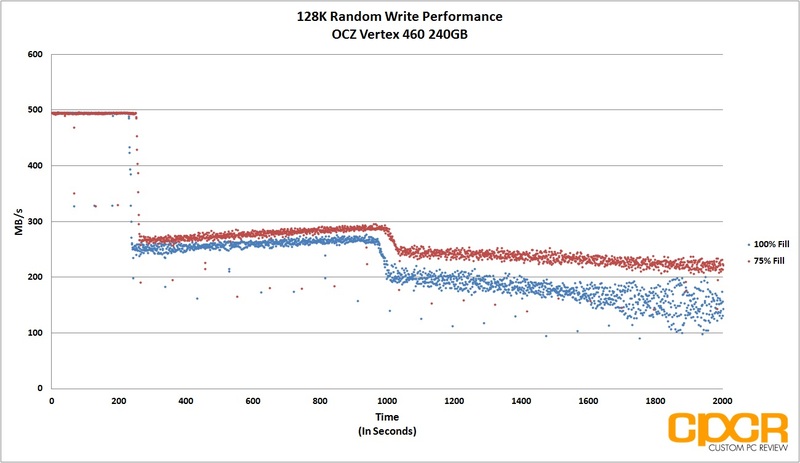 Data compression does not affect drive performance. Like what we saw previously, performance in Crystal Disk Mark is very good as well. 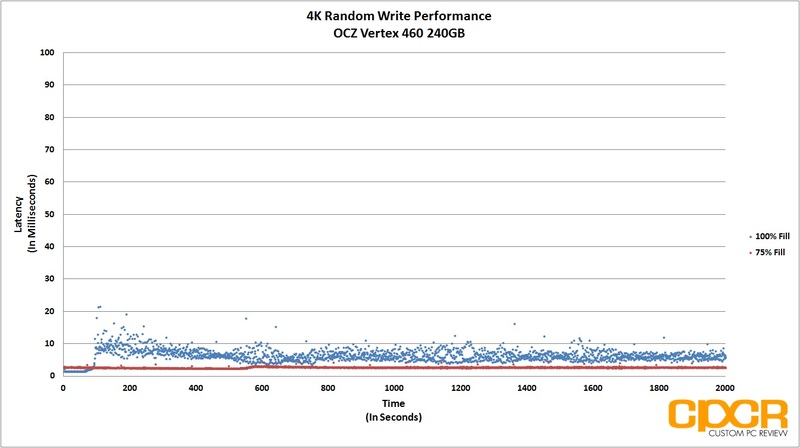 Sequential read/write performance reached 538/493 MB/s and 551/518 MB/s at QD32. 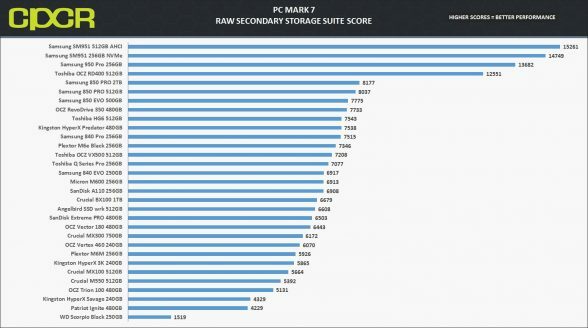 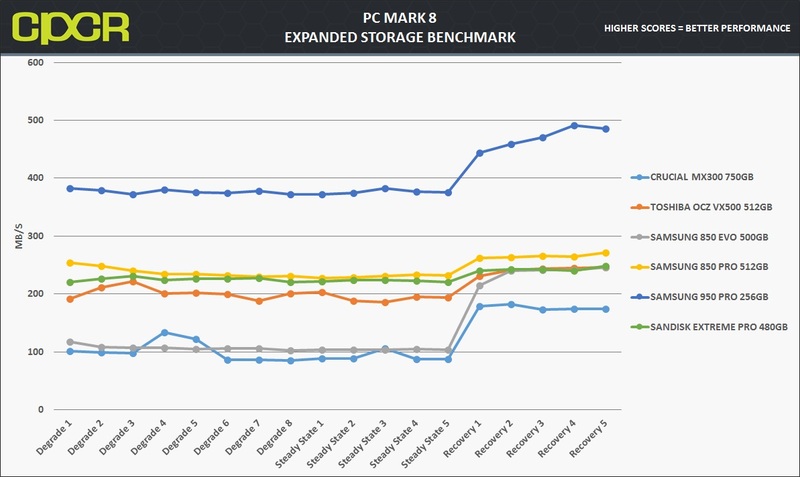 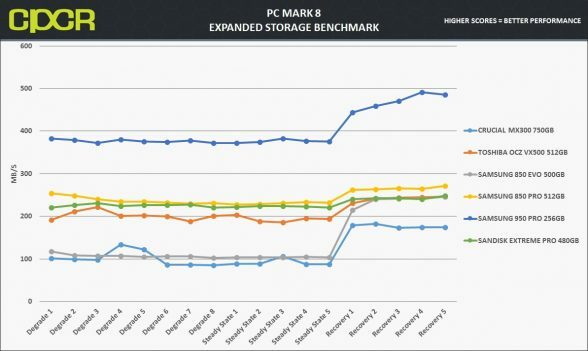 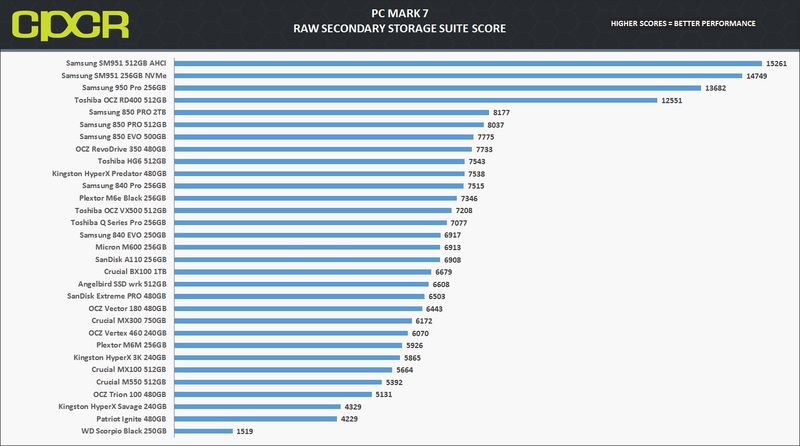 As of June 2015, we’ve also changed our comparison charts to use the PC Mark 7 Raw Secondary Storage Score. 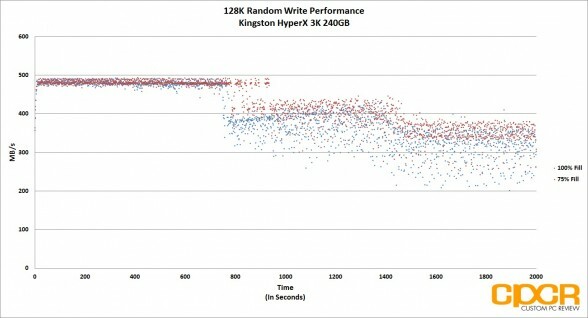 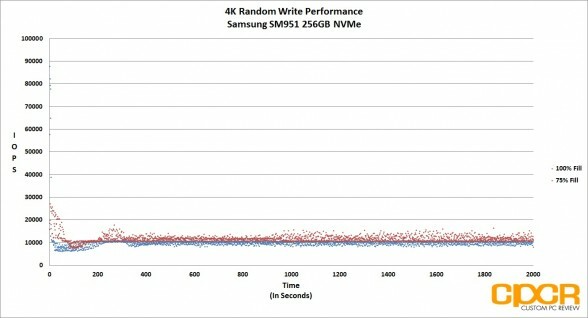 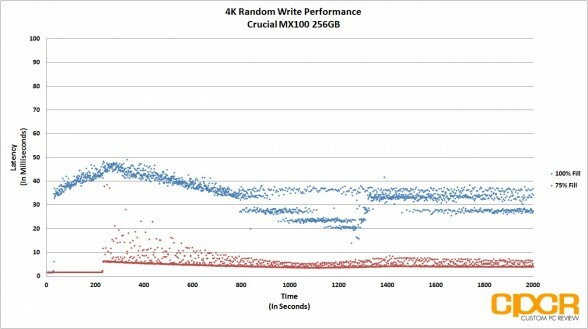 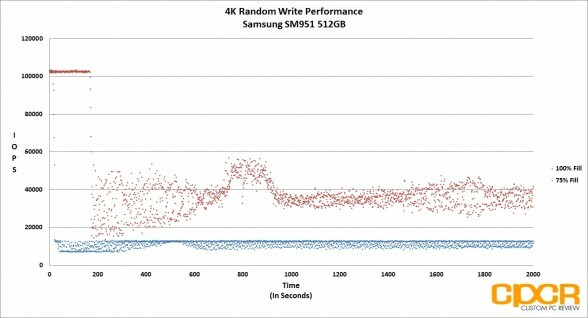 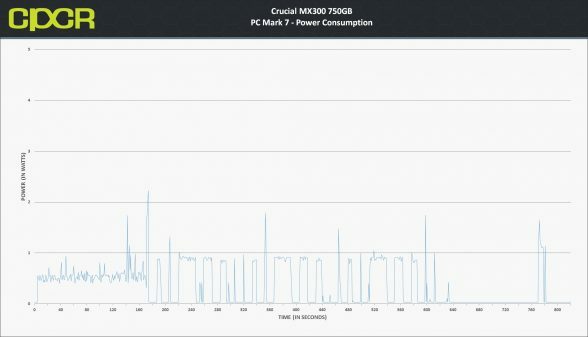 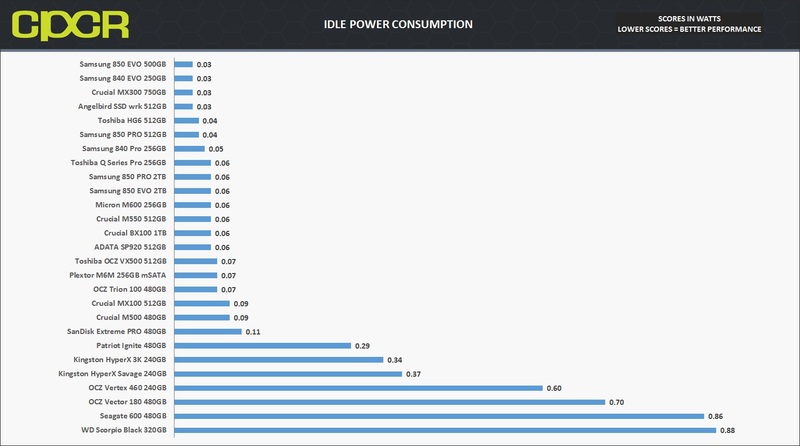 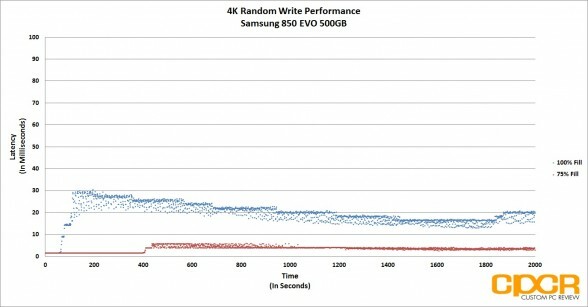 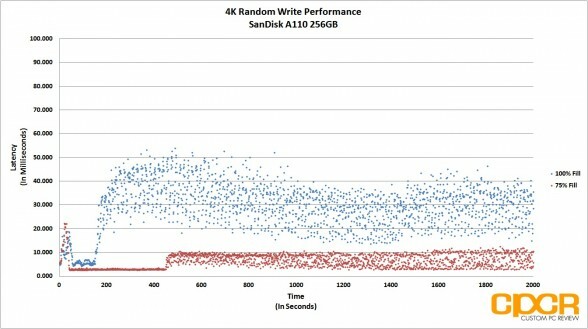 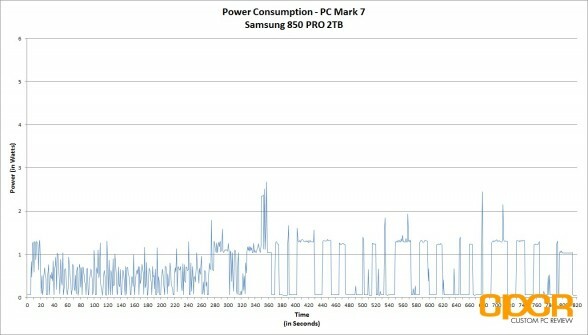 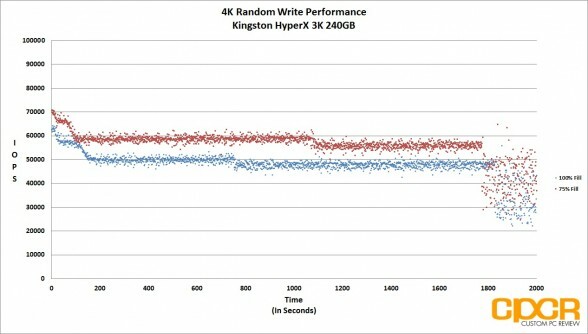 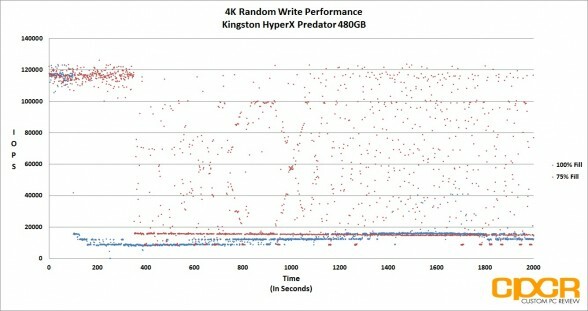 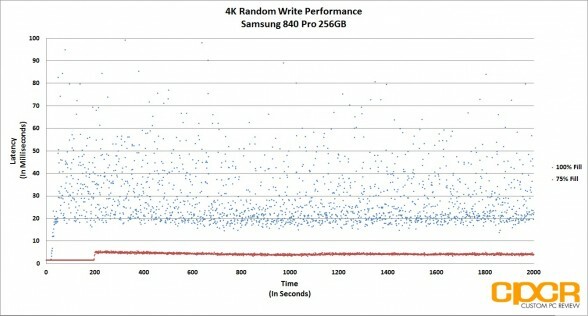 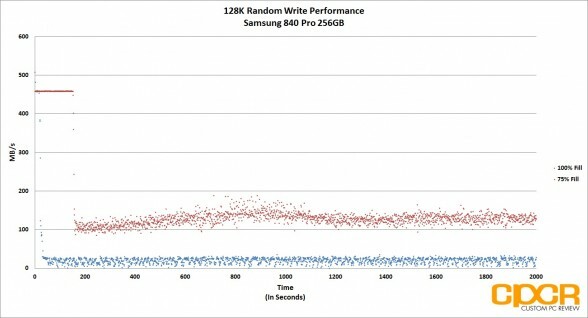 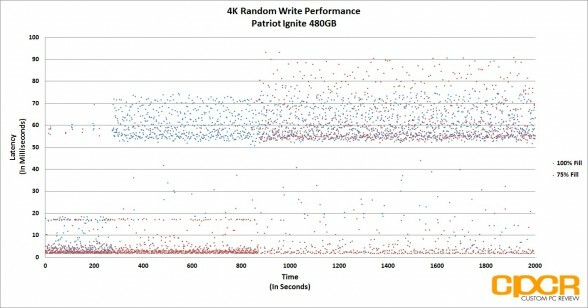 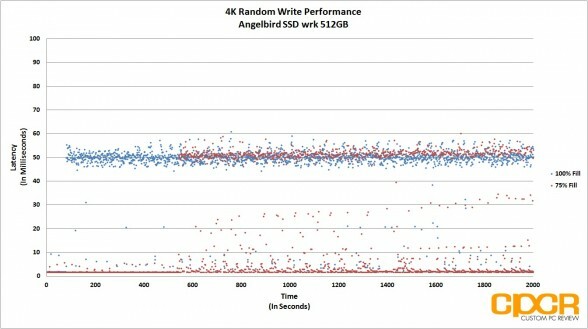 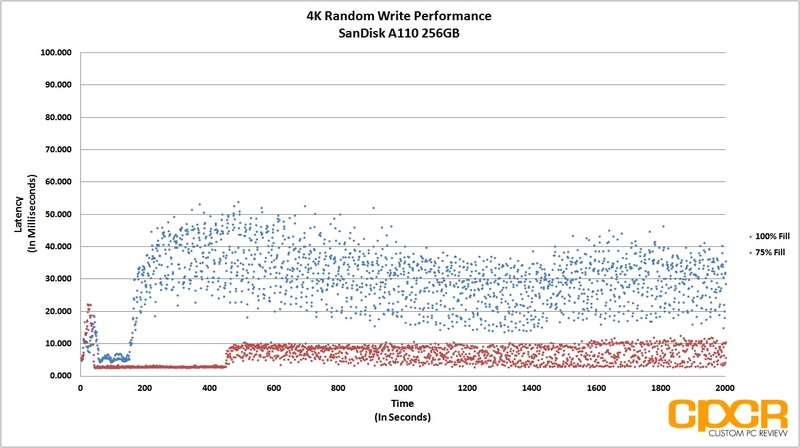 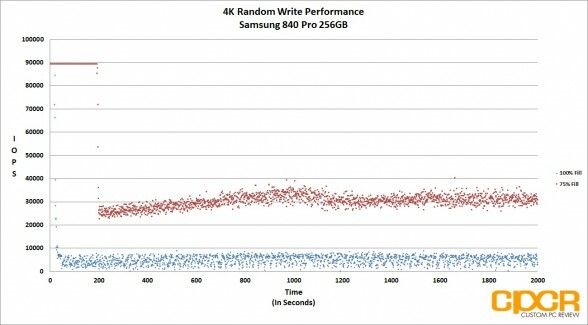 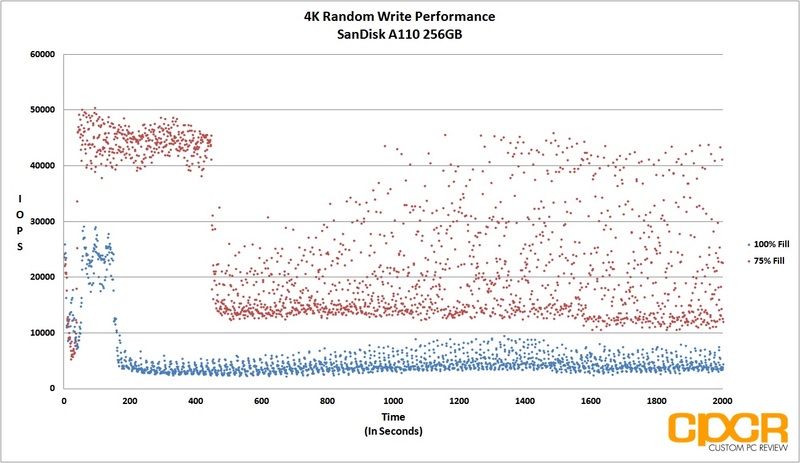 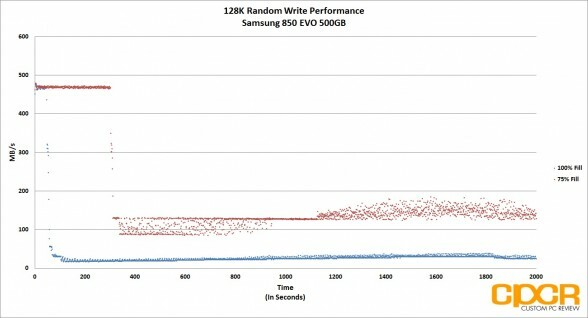 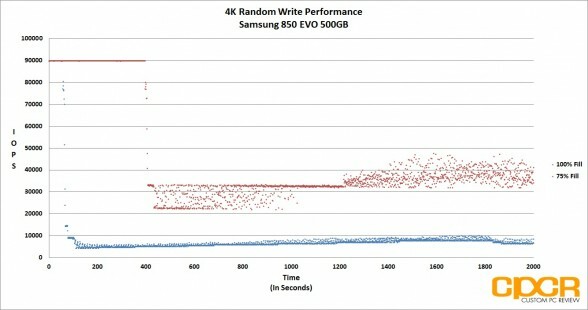 The raw score more effectively highlights performance differences between drives as it discounts idle time between tests. As a MLC SSD, the Toshiba OCZ VX500 512GB came in around the upper middle of the pack with a raw score of 7208. 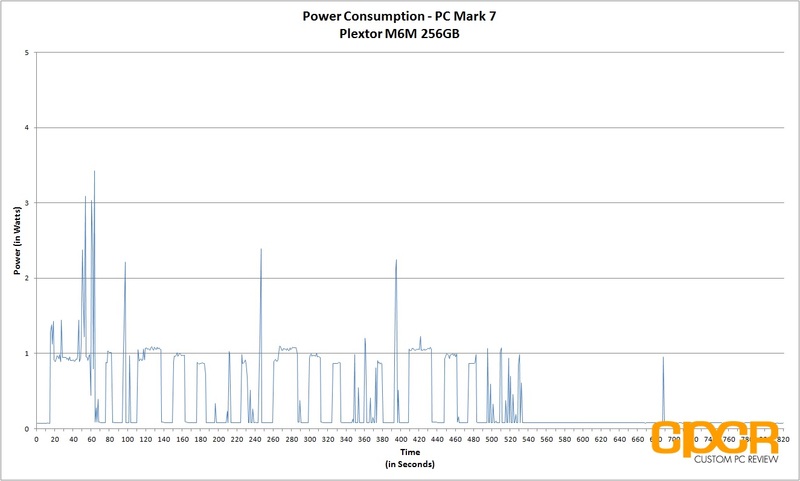 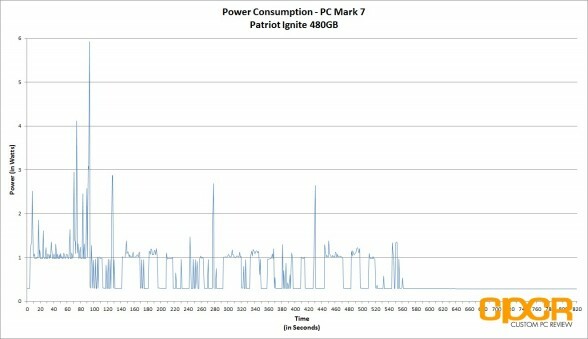 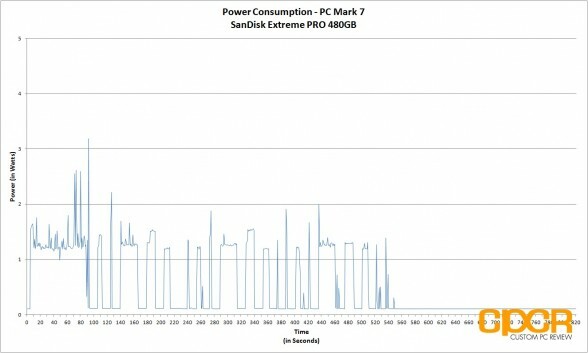 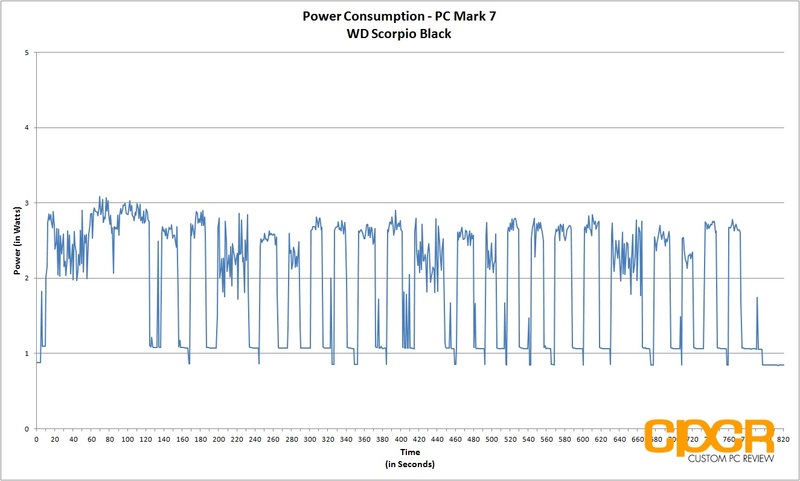 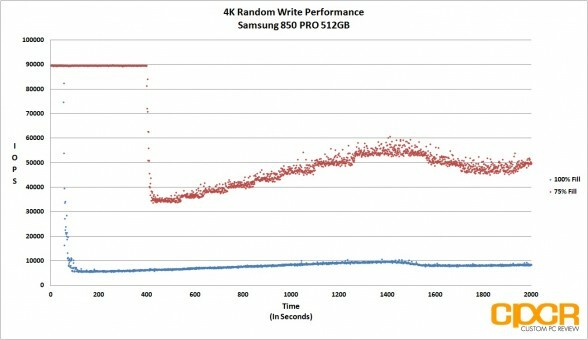 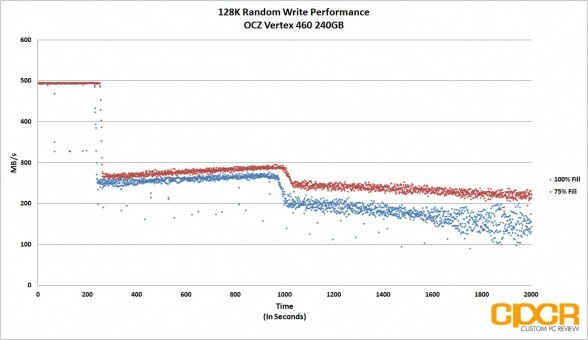 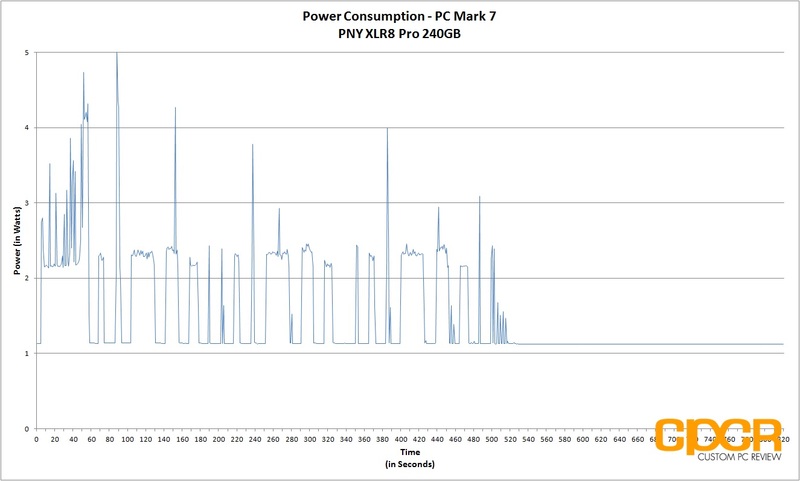 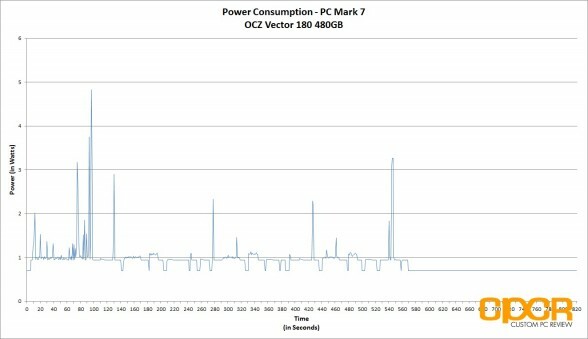 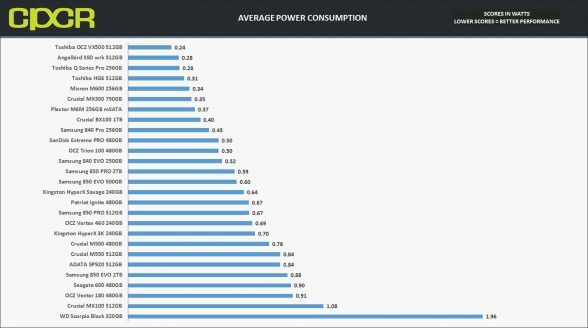 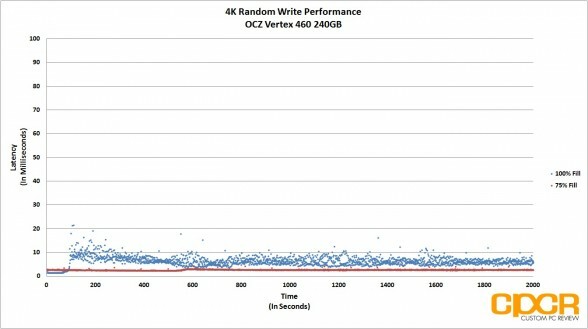 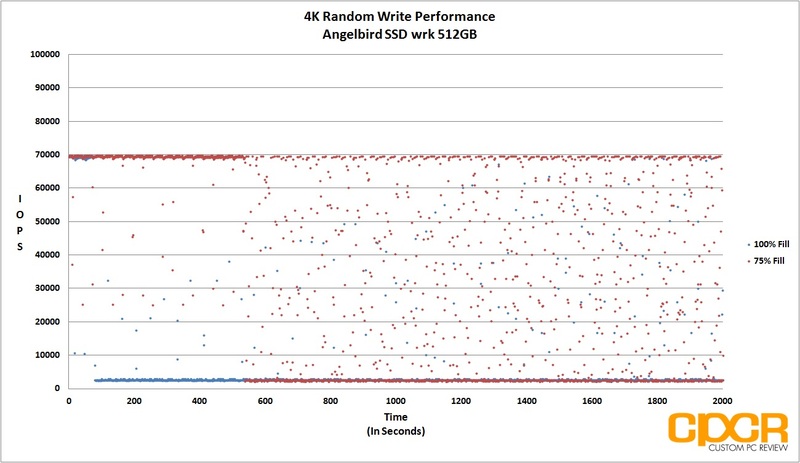 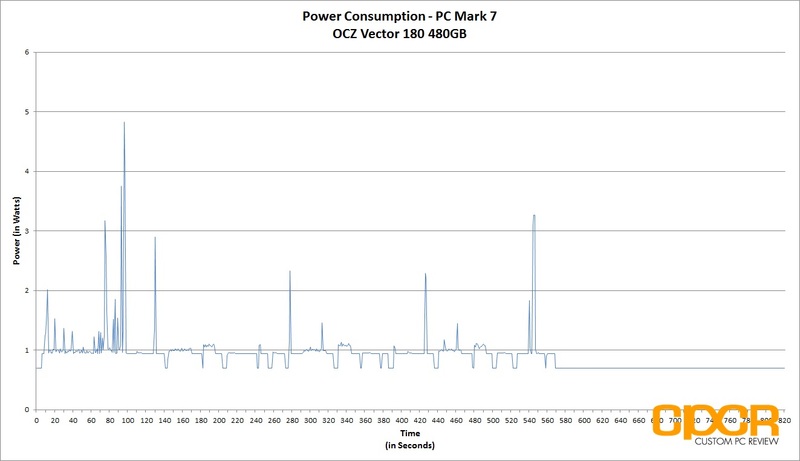 This is ~12% increase in performance from the OCZ Vector 180. With its MLC NAND, the Toshiba OCZ VX500 512GB was able to outperform TLC NAND based SSDs in heavier workloads, but scored slightly lower compared to MLC based competitors. In fresh out of the box testing, the Toshiba OCZ VX500’s performance fairly average for a mainstream SATA drive. 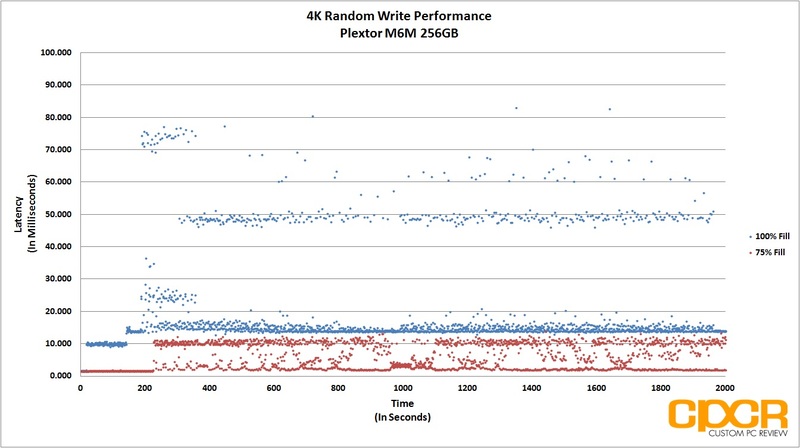 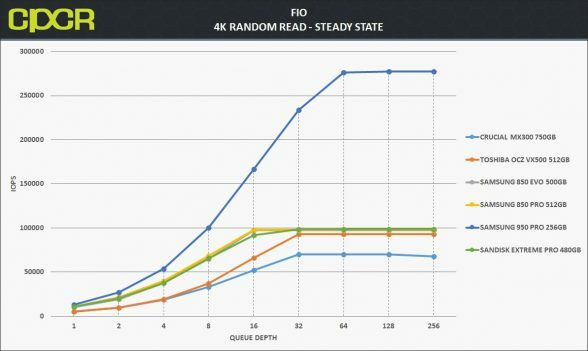 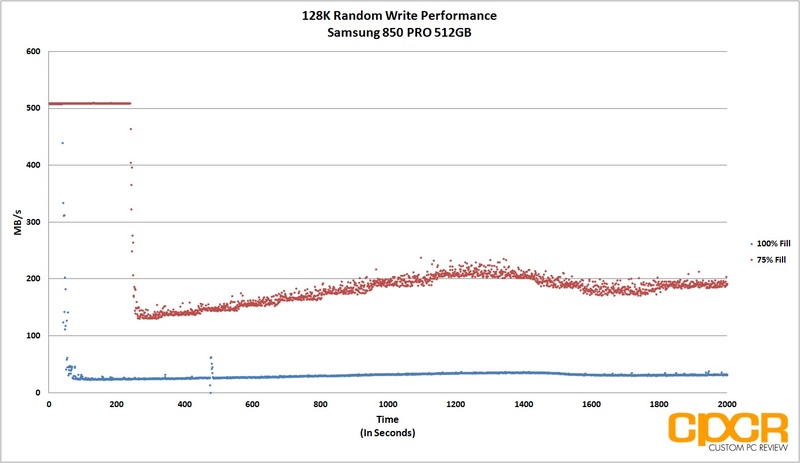 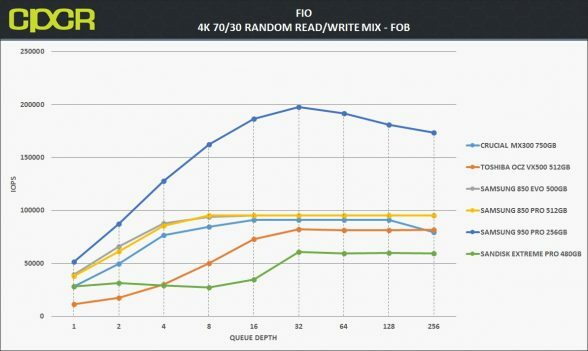 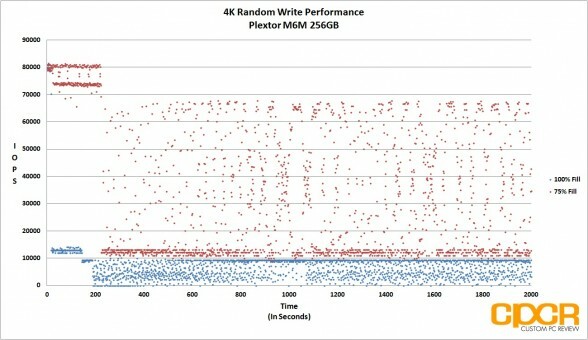 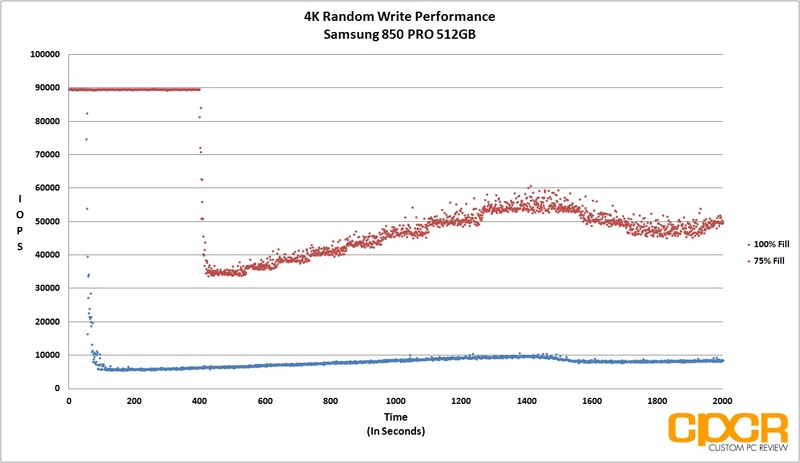 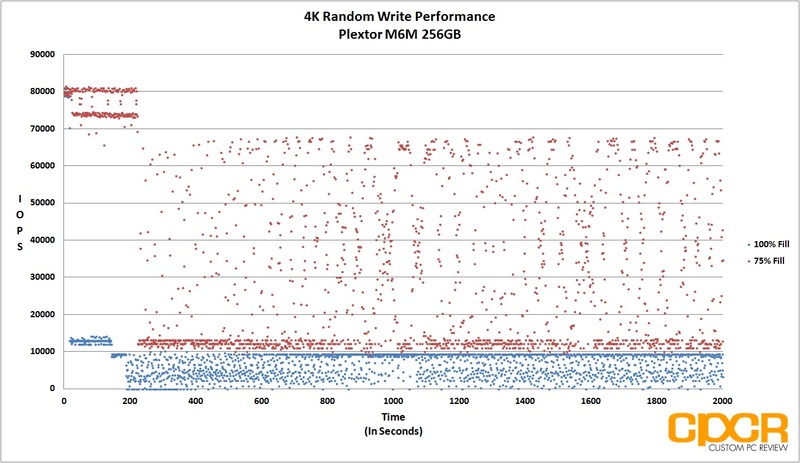 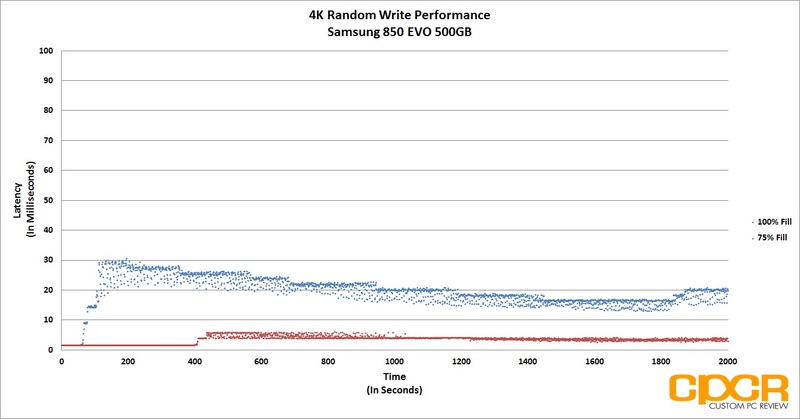 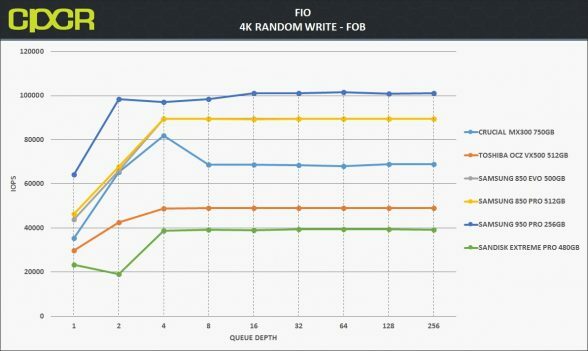 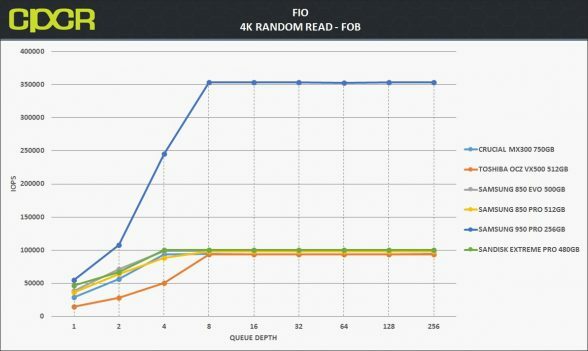 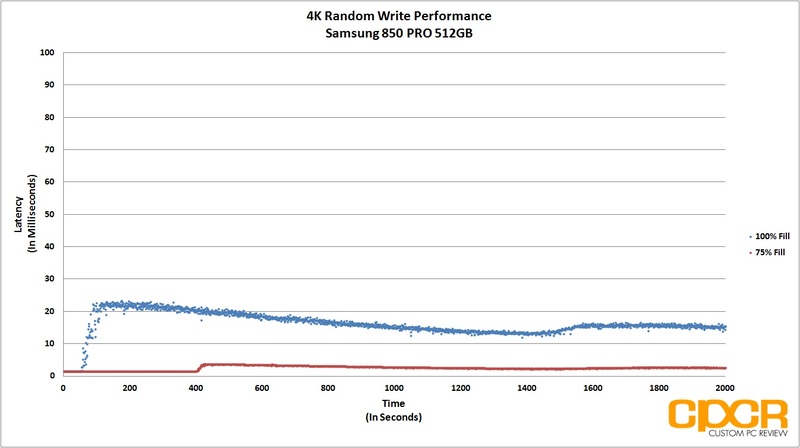 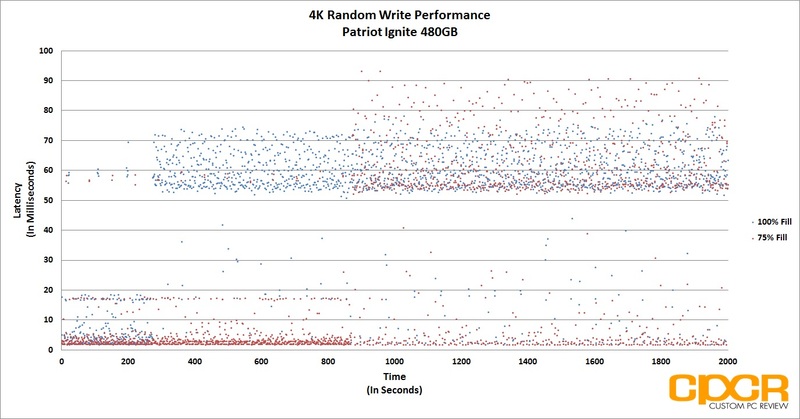 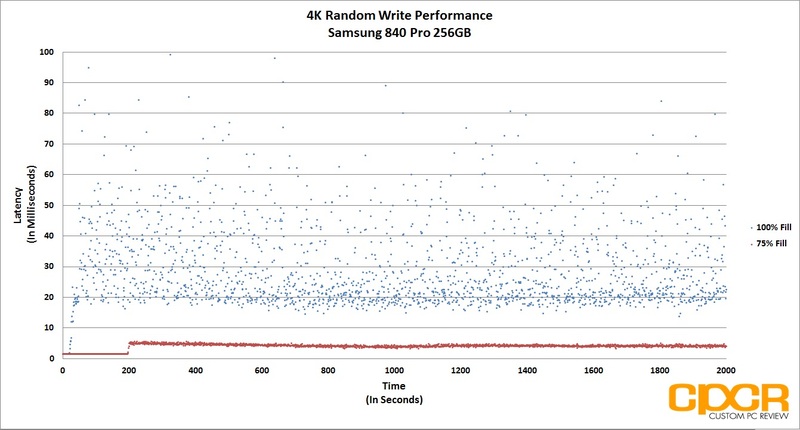 4K random read performance was able to reach 93,000 IOPS and 4K random write performance reached 50,000 IOPS. 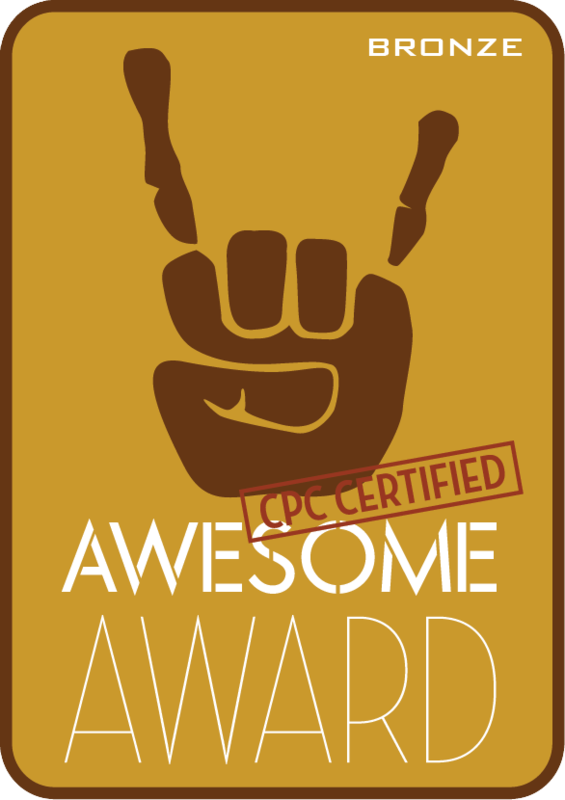 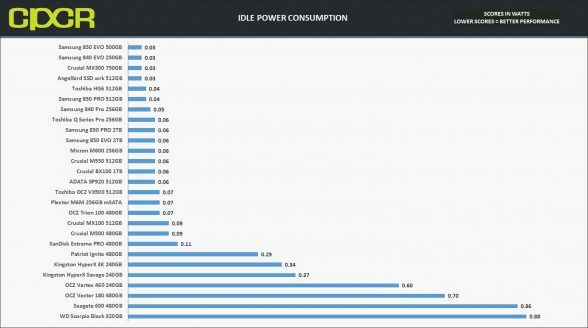 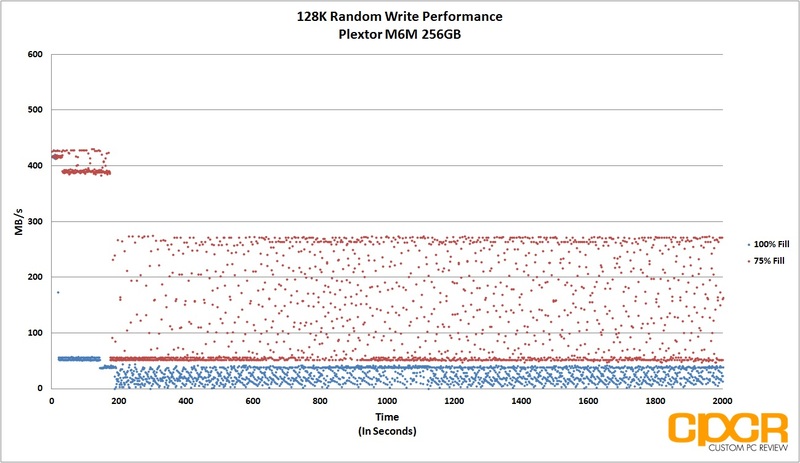 Mixed workload performance reached 82,000 IOPS. 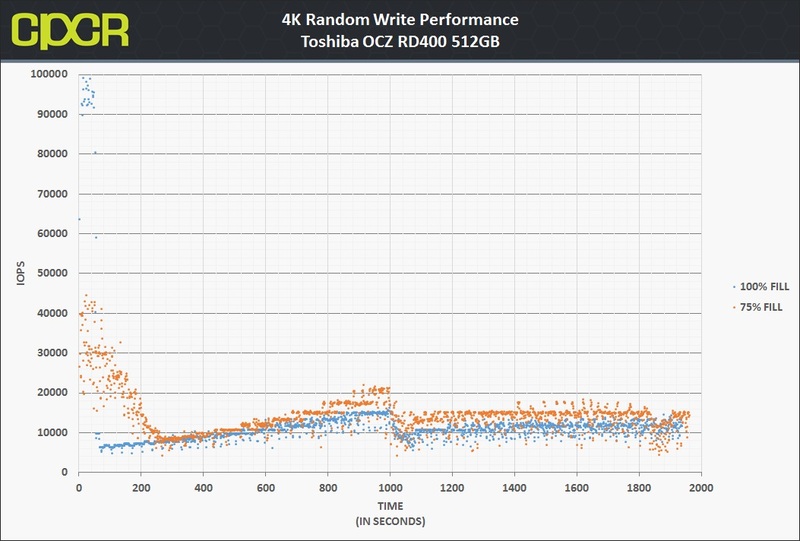 Similar to FOB performance, steady state performance on the Toshiba OCZ VX500 is relatively uninspiring. 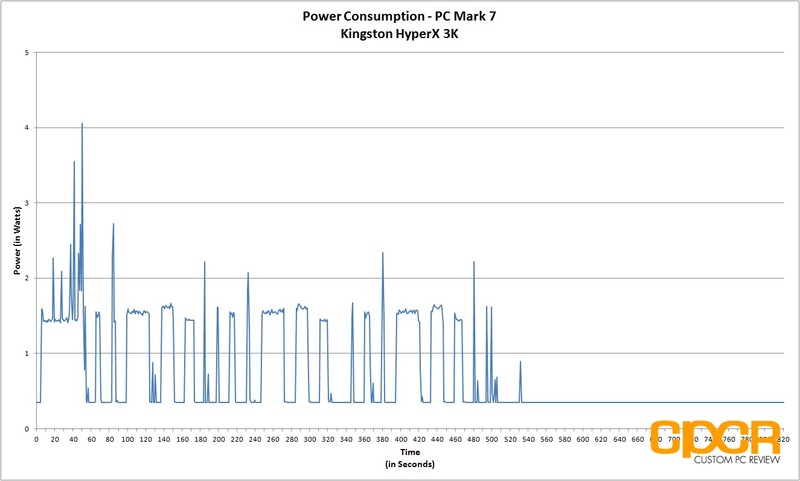 Performance here is fairly close to the Crucial MX300 which is a TLC NAND based SSD. 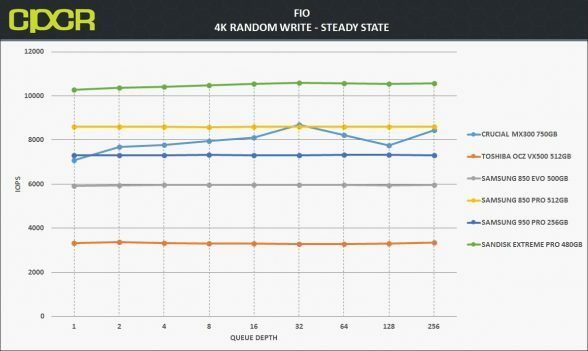 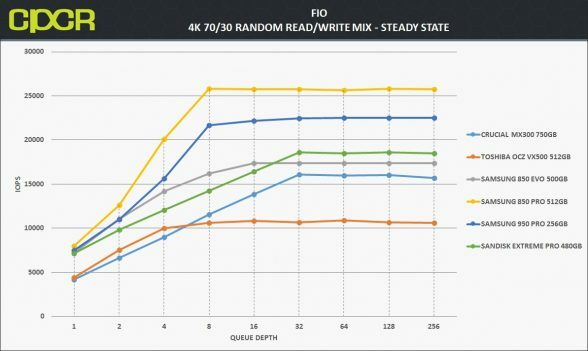 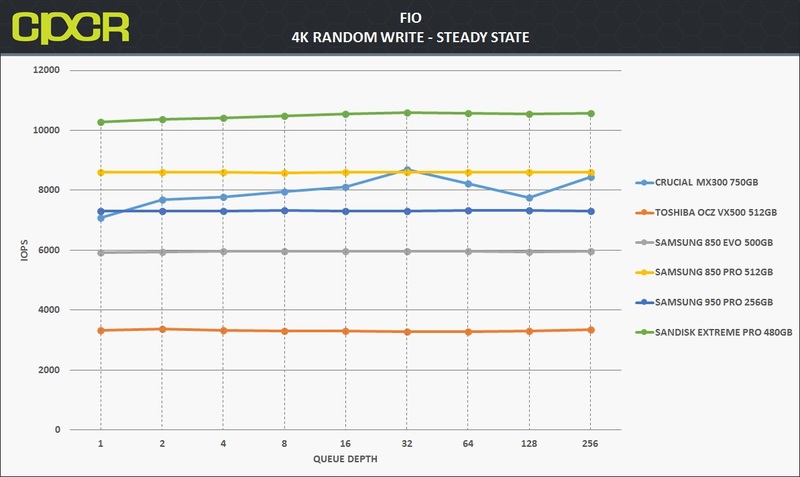 4K write consistency is acceptable although there’s definitely a lot of room for improvement especially considering the recently launched RD400 has significantly better consistency. 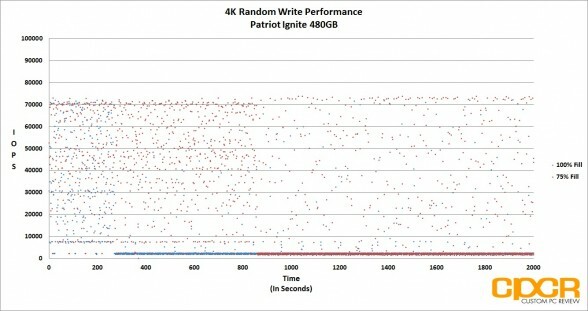 The technology is there. I’m just not quite sure why it’s not being used in this instance. 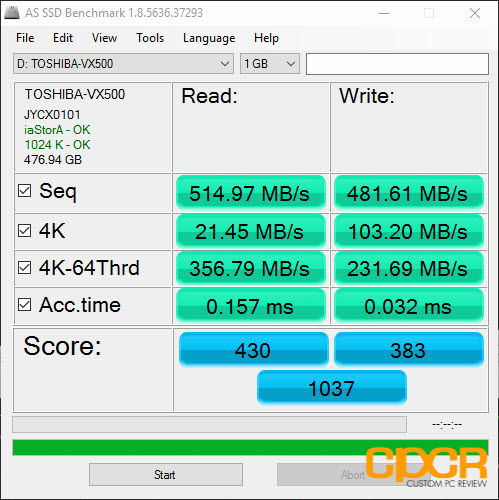 Latency on the VX500 512GB wasn’t very good for a drive that’s supposed to be in the higher end of the SATA SSD spectrum. 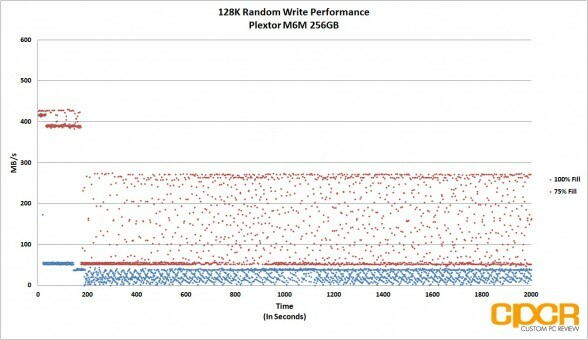 This was especially apparent in our testing with the drive at 100% fill. Here, latencies reached just shy of 80ms at its worst and there was quite a few writes that topped 50ms. 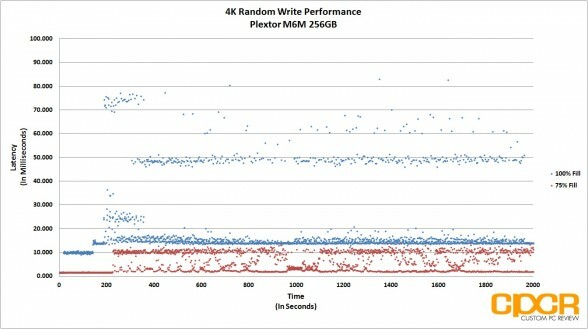 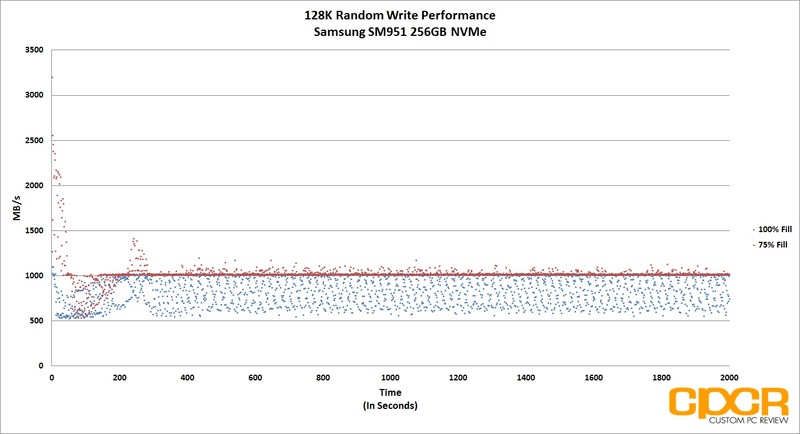 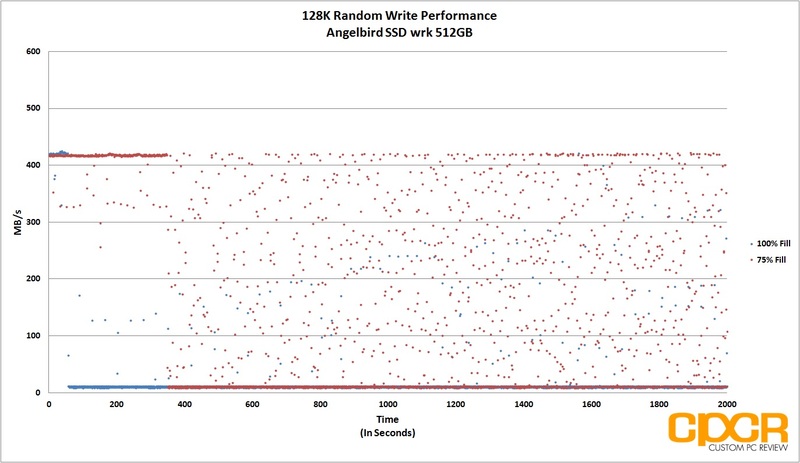 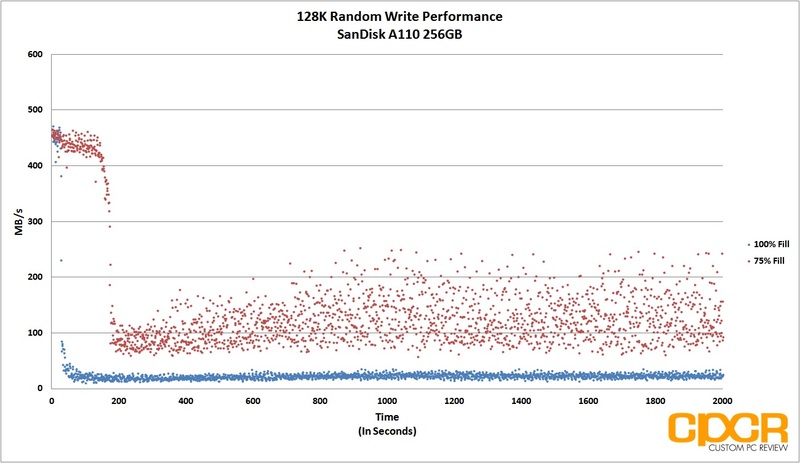 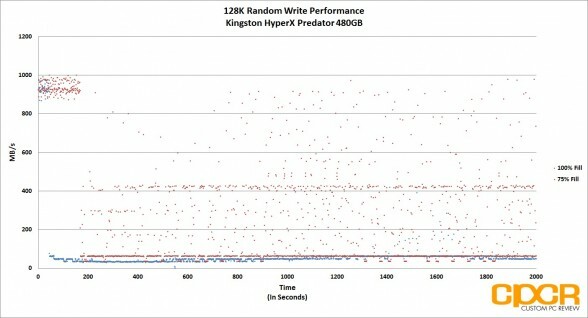 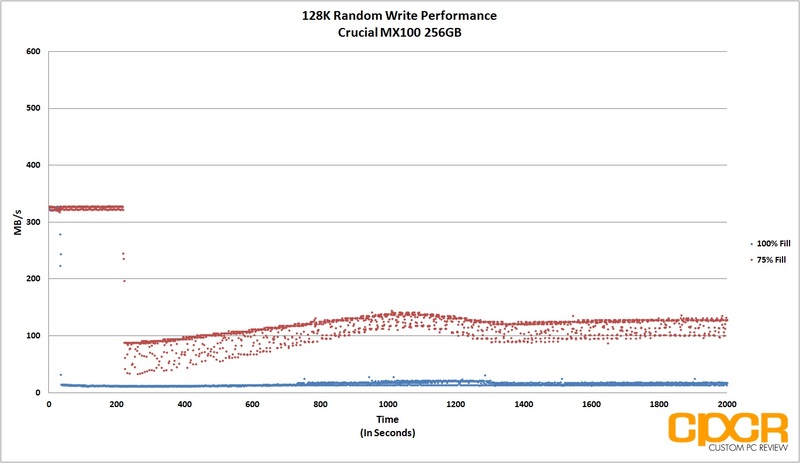 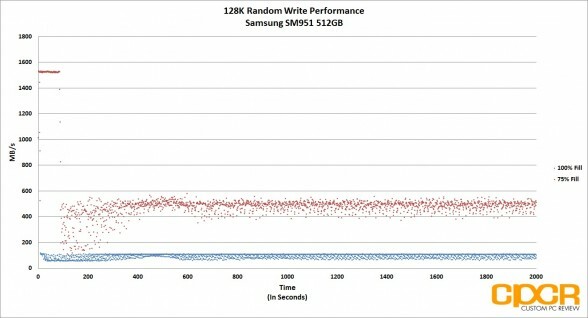 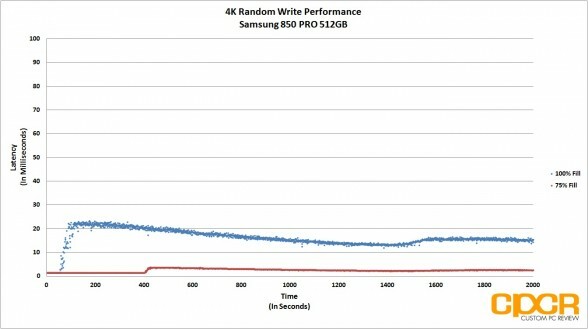 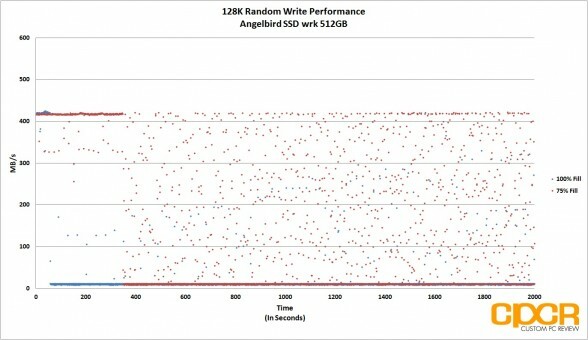 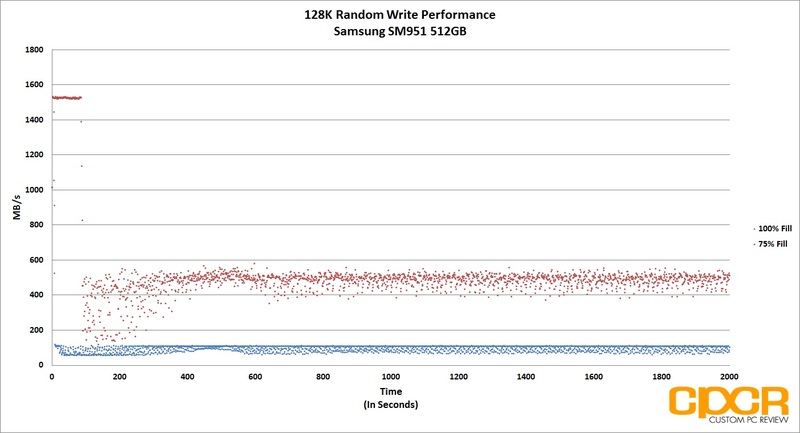 128K write performance was very inconsistent especially in our testing with the drive at 75% fill. In some instances there was variances of over 150MB/s. Power efficiency was never OCZ’s strong suit, but thanks to integration of Toshiba technologies, the VX500 is one of the most power efficient drives we’ve tested. These days, the Toshiba OCZ VX500 is competing in a very difficult market segment. 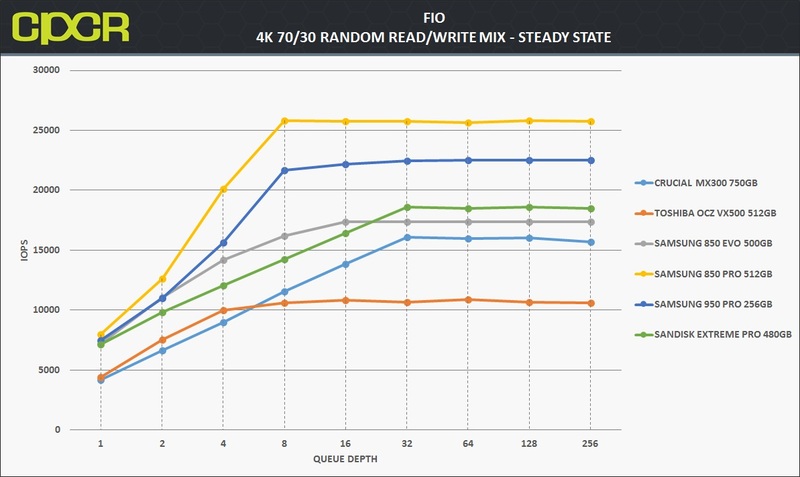 Enthusiasts who want top notch performance tend to look to PCIe based SSDs while most mainstream users who simply want better performance than their aging hard drives focus on TLC NAND based SSDs which have significantly come down in price over the past few years. 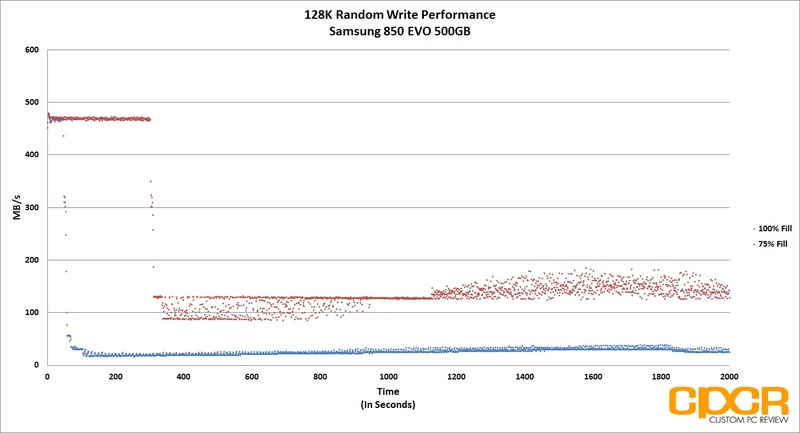 This leaves SATA based MLC SSDs in a very difficult spot especially when Samsung’s 3D TLC NAND based 850 EVO already brushes up on the SATA bus limits and offers endurance similar to what MLC drives can offer. 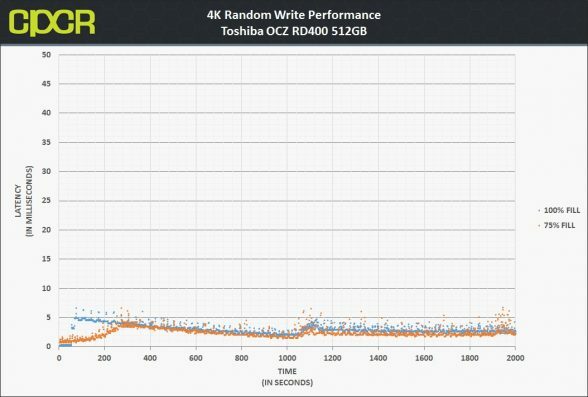 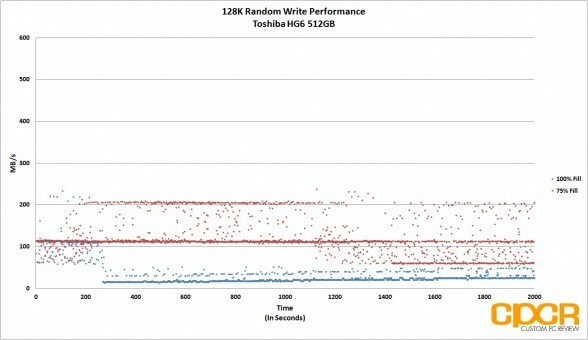 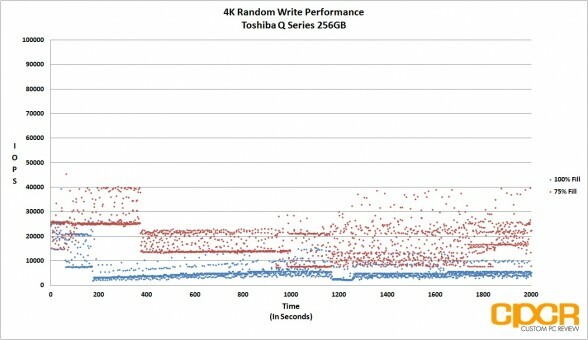 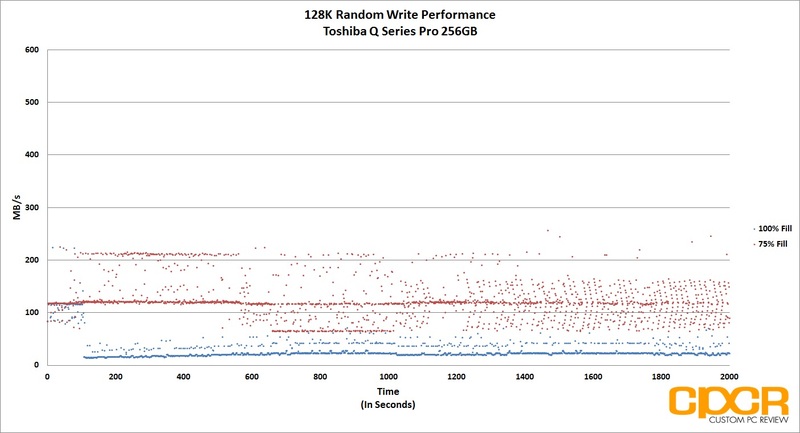 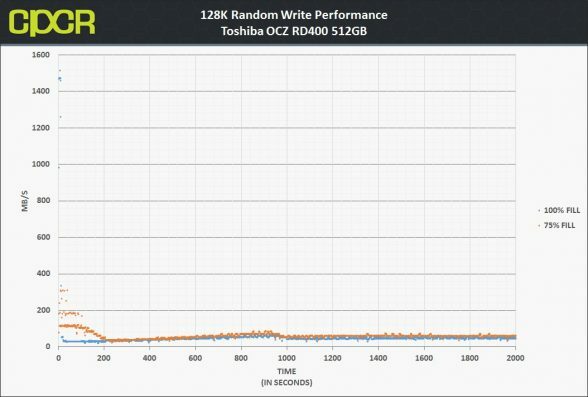 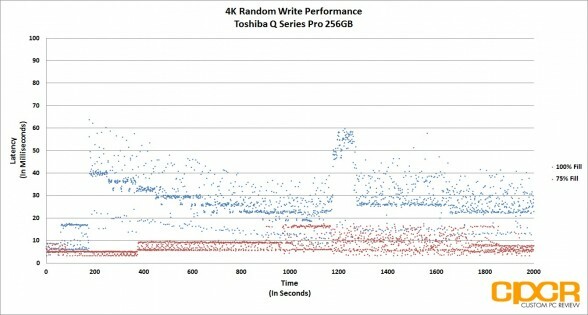 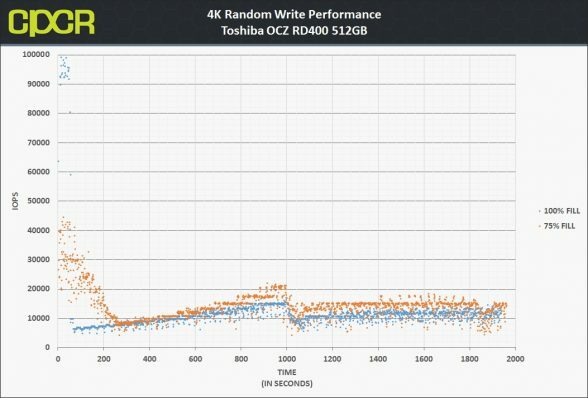 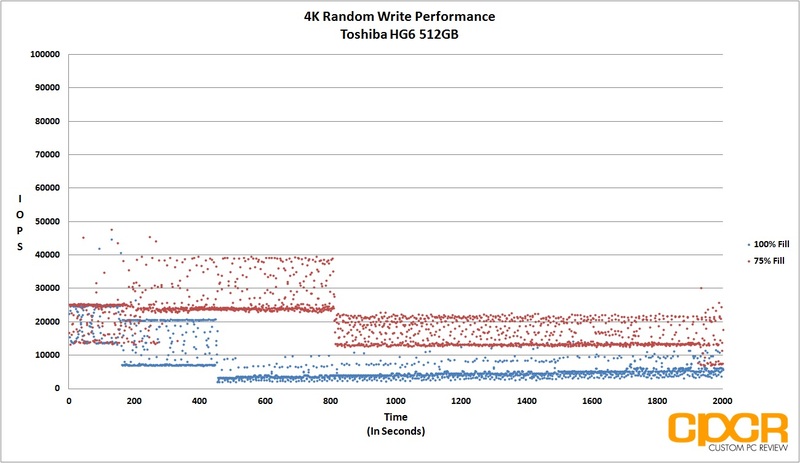 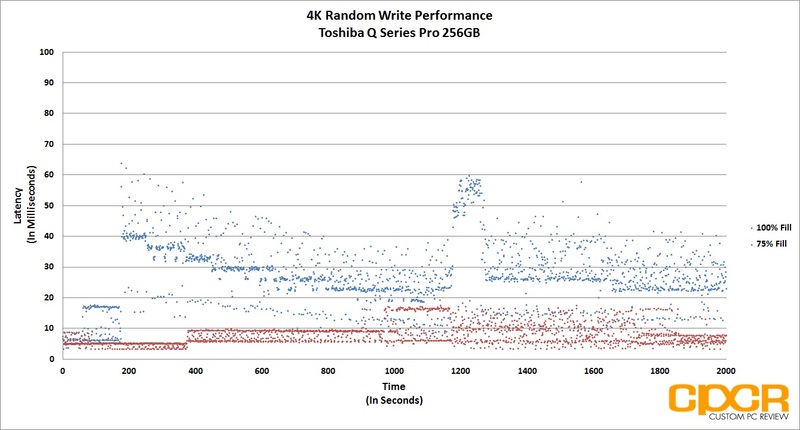 As for the Toshiba OCZ VX500 512GB, performance was a mixed bag overall. In some areas we definitely saw some great performance, but in others the performance was a bit lacking. 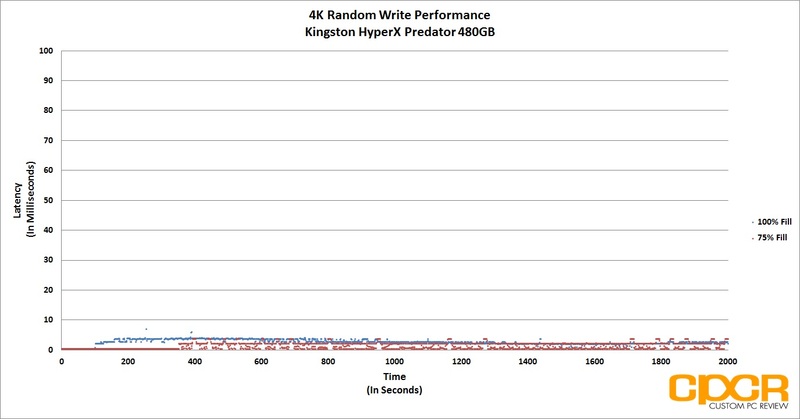 This is especially apparent in heavy write scenarios where we saw 4K write latencies jump beyond 50ms which is generally considered the limit before user experience begins to suffer. 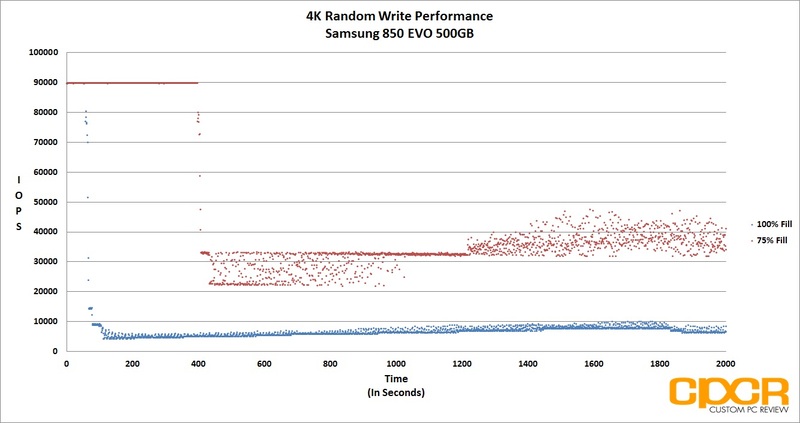 That said, in lighter usage scenarios, the drive performed very well and in most of our testing, with the exception of the Samsung 850 EVO, the VX500 outperformed TLC NAND based SSDs without much issue. In most general consumer workloads, the Toshiba OCZ VX500 should perform very well although those with higher demands of their SSDs may find it a much better option to pick up something like the Samsung 850 Pro, or a step higher into the Samsung 950 Pro or Toshiba OCZ RD400. 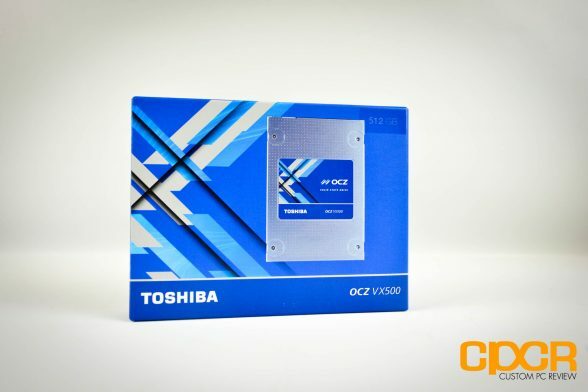 According to Toshiba OCZ, MSRP on the VX500 will range from $63.99 for the 128GB edition to $337.06 for the 1TB edition. 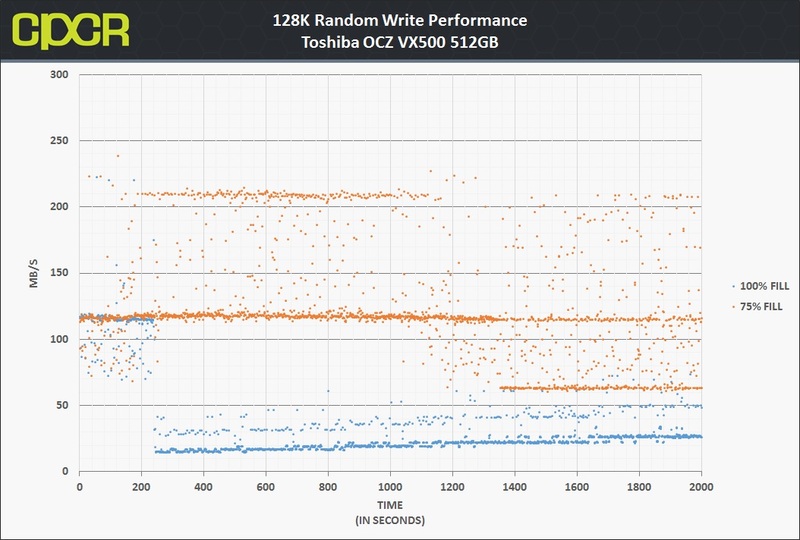 This puts the drives at around the $0.30-$0.35 per gigabyte range for the more common 256-1TB capacities which is pretty standard for premium SATA based SSDs. 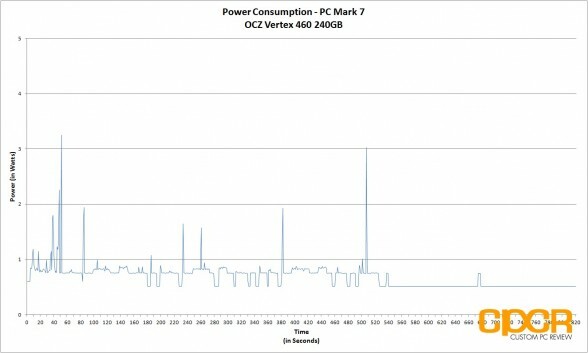 Of course as the drives start to hit the market, prices are expected to drop somewhat which is great news as its current price is a bit expensive considering the level of performance available to the drive. 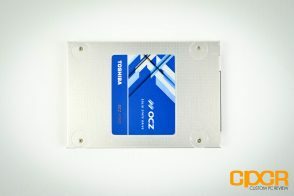 Overall, the Toshiba OCZ VX500 is just another Toshiba SSD based on the same controller and the same NAND that we’ve seen before. 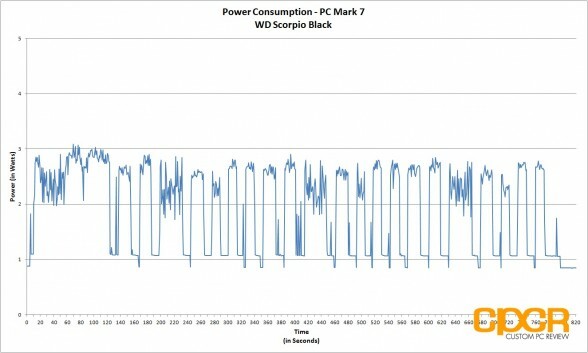 It’s a solid formula that provides reasonable performance and fantastic reliability, but at its current cost, it’s a bit difficult to recommend today. As prices come down however, it may be worthwhile especially for those who value a top notch warranty and MLC level endurance.